Jared Donaldson and Gilles Simon fall in second round. 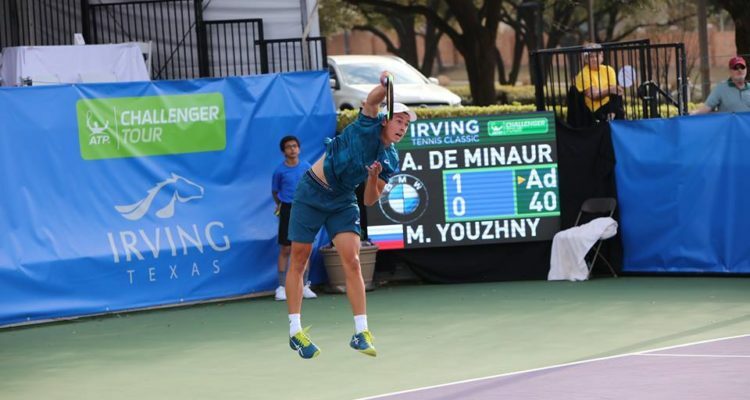 #NextGenATP Australian Alex de Minaur emerged victorious from the battle of the generations against Russian veteran Mikhail Youzhny to reach the quarterfinals of the $150,000 Irving Tennis Classic held at the Four Seasons Golf and Sports Club at Las Colinas. On a very windy Thursday afternoon, the 19-year-old capitalized on five of his nine break point opportunities to secure a 6-2, 2-6, 6-2 victory in one hour and 42 minutes. “Try to make as many balls as possible. It’s not going to be a pretty match either way, and that’s what I try to do,” de Minaur described the difficult conditions. “I’m incredibly happy with where my level is at, and I obviously started really well in the Australian summer, and now the key is pretty much to keep that going. The teenager will next take on the No. 3 seed Steve Johnson. The World No. 52 from the United Stated eased past Slovakian Lukas Lacko 6-0, 6-2 in exactly one hour of play. Johnson remains the highest ranked player left in the singles draw, as the tournament’s No. 2, Jared Donaldson, fell in the second round to Mikhail Kukushkin. The 30-year-old from Kazakhstan outpointed his young opponent from California 69-52 to earn a 6-3, 6-3 win in one hour and 20 minutes. “Both of us are going to have our chances to win”, but coming from being a finalist in 2017, he likes his chances,” Kukushkin said. He will next face US-American Bjorn Fratangelo. 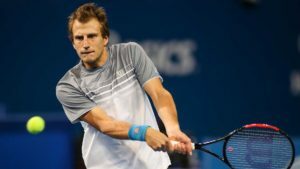 Mirza Basic knocked out fifth seed Gilles Simon. The 26-year-old from Bosnia and Herzegovina beat the former top 10 player of France 7-5, 3-6, 6-3 to face Italy’s young gun Matteo Berrettini in the stage of the final eight. Marton Fucsovics fought past Elias Ymer of Sweden 6-4, 3-6, 6-3. The No. 4 seed from Hungary won 51 per cent of the total points played to prevail after one hour and 56 minutes. Fucsovics will next play qualifier Petros Chrysochos of Cyprus. This entry was posted in ATP Challenger Irving, ATP Challenger Tour and tagged Alex de Minaur, ATP Challenger, Irving Tennis Classic, Mirza Basic.